Katie Lally graduated St. Patrick's School in 2009. Katie was the first of the four Lally siblings to graduate from St. Pat's. Katie then had a great run at Our Lady of Mercy Academy in Syosset, graduating in 2013. Among her accomplishments at Mercy, she was captain of the swim team. Katie in now finishing her sophomore year at The Catholic University of America in Washington, D.C. Katie has had the wonderful opportunity to work as an intern for Congressman Peter King (R Long Island) while studying at CUA. 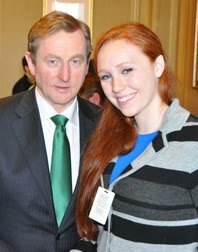 On St. Patrick’s Day, she was invited to the Capitol by Congressman King during a luncheon for Irish politicians, who were in D.C. to meet with President Obama. In attendance were many political figures from Ireland. 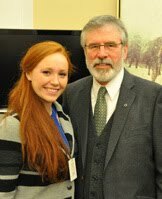 Katie met with some of them, most notably, Prime Minister of Ireland, Enda Kenny, and head of Sinn Fein, Gerry Adams. Katie was also able to meet the President of the United States, Barack Obama. The President shook hands with Katie and spoke with her. You can watch their interaction in the following video. QuickTime Player, on a computer (not mobile), is required to view the video. Katie's father, Mike, recently wrote the following to St. Patrick's Principal Sister Maureen. "I thought it would be nice for you to see what becomes of one of the kids you helped form at St. Patrick’s. A solid life is based on a solid foundation. I believe she has that solid foundation in part because of you and your staff. Her 8 years at St. Pat’s did not go without bumps and bruises, but with hard work and the Lord’s blessings, she has accomplished much so far in her 19 years. 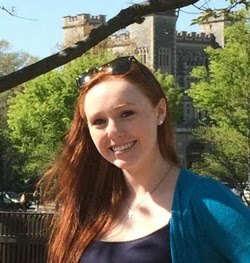 Katie has a 3.8 GPA at CUA and Phi Eta Sigma Honor society for academic excellence. She is just beginning her life’s journey, but I thought a quick look back from where she came from was proper gratitude." It's always nice to hear sincere praise for Catholic education and to see Katie doing so well!